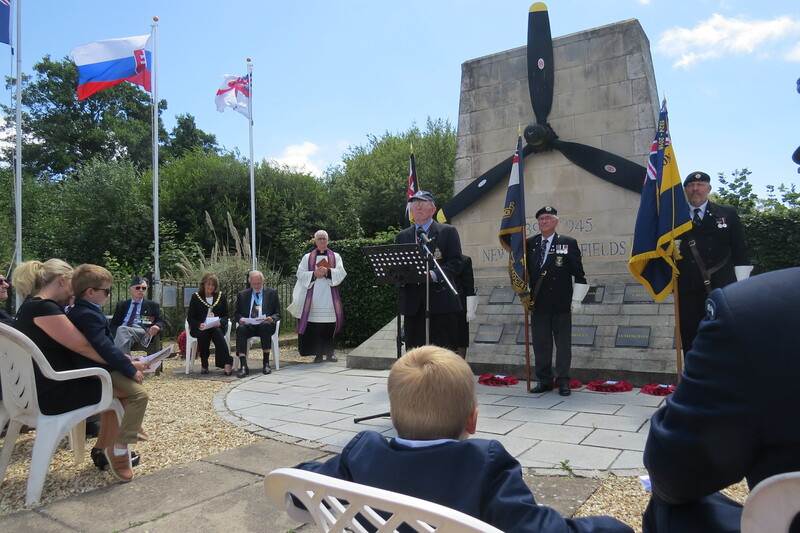 The annual outdoor New Forest Airfields service was originally held in August on the anniversary of the Memorial’s dedication. 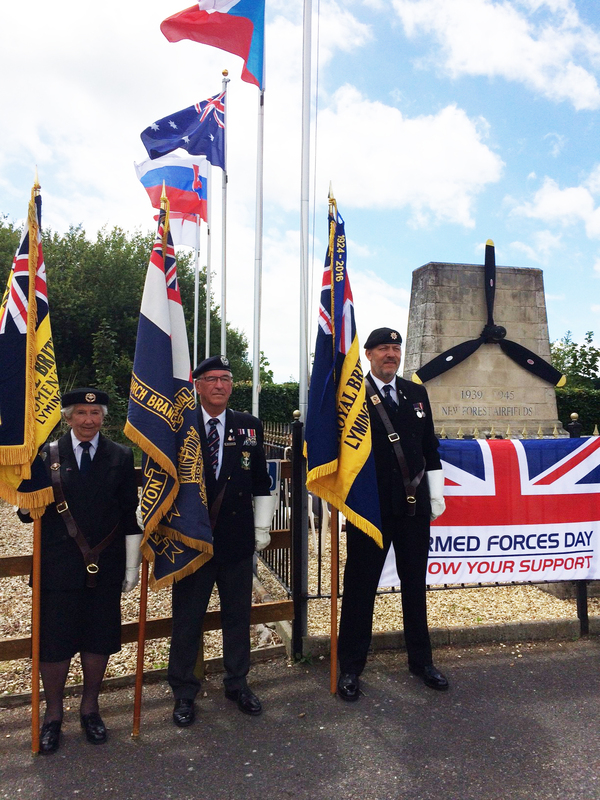 When the UK introduced what is now UK Armed Forces Day, the Service was moved to the Sunday closest to that day – usually the last Sunday in June. Scroll down for photographs of the 2016 service, at the end of this page. The 2017 Service report will be found on our website home page. The service is attended by civic dignitaries, MPs, members of the Armed Forces, Veterans, members of Cadet Units and the public. 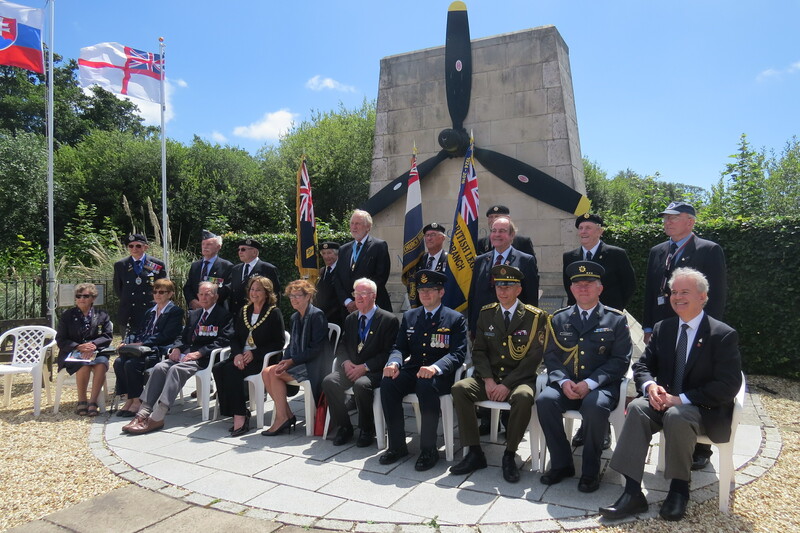 Traditionally, we have always invited representatives of those other nations whose squadrons flew from the twelve airfields active between 1939 and 1945. Representatives of the Commonwealth; Canada, Australia and New Zealand are joined by the United States of America, Russia and European nations; Poland, the Czech Republic, Slovakia, Norway and the Netherlands. The Soviet Air Force had a ferry unit at RAF Hurn in 1943 and seaplanes of both the Royal Norwegian and Royal Netherlands Navies were present for a short time at Calshot in 1940. “WELCOME TO EVERYONE, “During my years of service in the Royal Air Force I have been privileged to conduct services of Remembrance: in Tobruk in Libya and in Kranji in Singapore as well as visits to that most notable military cemetery in El Alamein. Also a few years ago I conducted a most moving Service of Remembrance in Port Stanley in the Falkland Islands in the lee of mount Tumbledown and two years ago, I conducted a D-Day Service of Remembrance in France aboard the Cruise Liner Braemar. “Our purpose here today on this 72nd Anniversary year of D-Day is to pay our respects to those by whose great courage, commitment and discipline made possible the liberation of Europe. “We give thanks for their prowess and determination as we remember before God the very many who made the ultimate sacrifice so that a great victory was achieved, and especially those who flew from these Airfields. “From time immemorial people and nations have recorded their great achievements, remembered their great leaders and honoured their dead and by this they have increased their self-respect as well as reducing the risk of boasting. And so, we too, today remember such sacrifice that was made in Normandy in 1944 by those who have gone before us. It is a mark of civilized people to recall noble achievements. We can’t escape being a part of our history, we all have a past, a present and a future and we remember the past so as to guide the present and inspire the future. “The Author G.K.Chesterton said; “The disadvantage of men not knowing the past is that they don’t know the present. History is a high hill or a high point of vantage from which alone men may see the town in which they live or the age in which they are living”. “We must not forget that from 1939 until 1945 the continent of Europe, as well as many other parts of the world were locked in mortal combat. Countries were ravaged, cities were destroyed, millions rendered homeless, countless numbers were maimed for life and millions died in battle, in bombings or as a direct result of the war. “Nothing in previous history had affected the civil population as much as that war, for the first time everyone was in it together. “Throughout our long history men and women have been found who have confronted evil with good, set standards, upheld truth and for that we must include in our commemoration, and especially at this time, all those whose courage and sacrifice opened the way to the liberation of the peoples of Europe in 1944. “You know it is a true saying that: “For evil to prevail, it only requires that good men do nothing”. The Planning, preparation, pursuit and carrying out of the duties of those who flew from these airfields is a shining example of the discipline and courage of good men and women, resolute and standing defiantly, against impossible odds for what they considered to be right against a wicked, and brutal dictatorship. And now having assembled here today we give thanks for all that was achieved and for all who made it possible, as well as holding in remembrance those who paid the ultimate sacrifice. We might recall the words of Sir Winston Churchill. “And so as we give our thanks for what was achieved, we look to the establishment and maintenance of peace in the future. Swords can be beaten into ploughshares and spears into pruning hooks and the worst of enemies can become the firmest friends. “And though we find ourselves today living in an uncertain world where some societies are riven by conflict, terror and civil war it is even more important to recall with thanksgiving the resolution and example of those in past conflicts who have stood against great odds for what they believed were good and true and noble values, and prevailed. 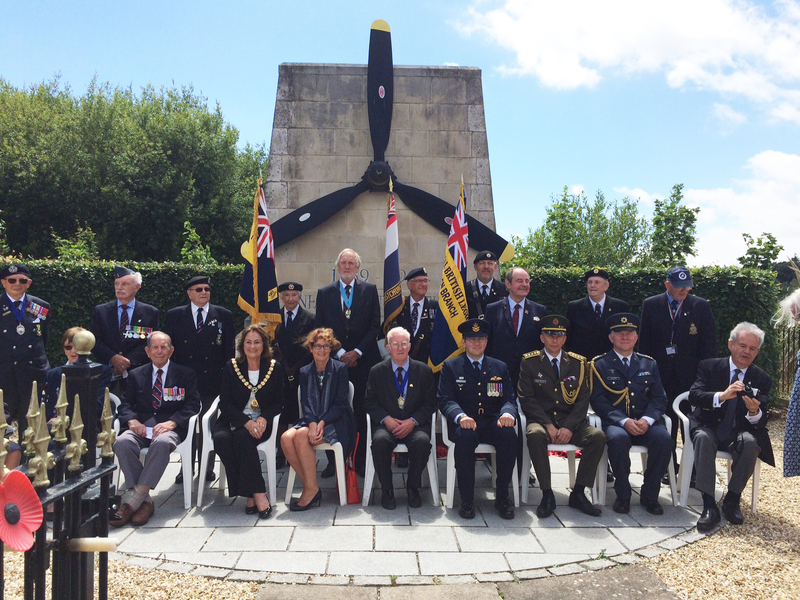 The Annual Service of Dedication of the New Forest Airfields Memorial – Sunday 25th June 2017. 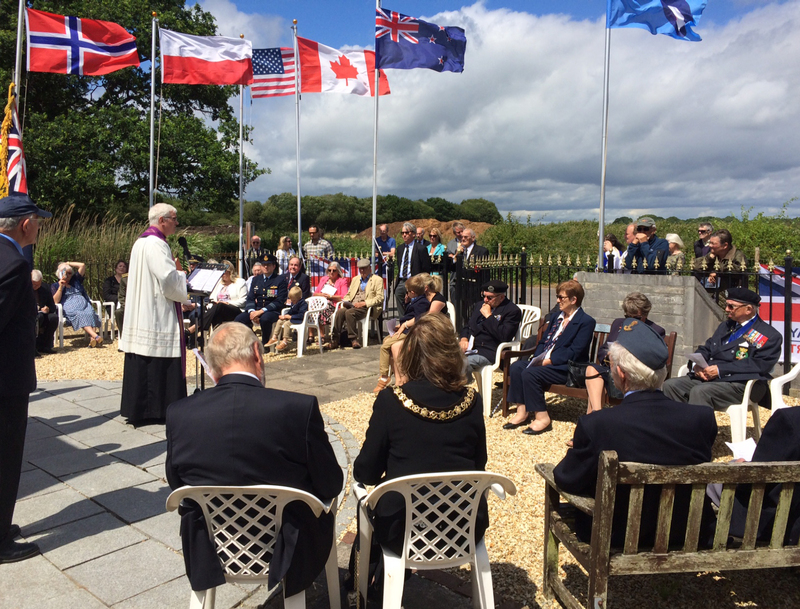 The FONFA Annual open air Memorial Service was held at the New Forest Airfields Memorial at the western edge of the WWII Holmsley South airfield, on Sunday June 25th at 2 p.m.
Civic Leaders and Representatives of the Czech and Slovak Embassies and the Australian Air Force attended the service. 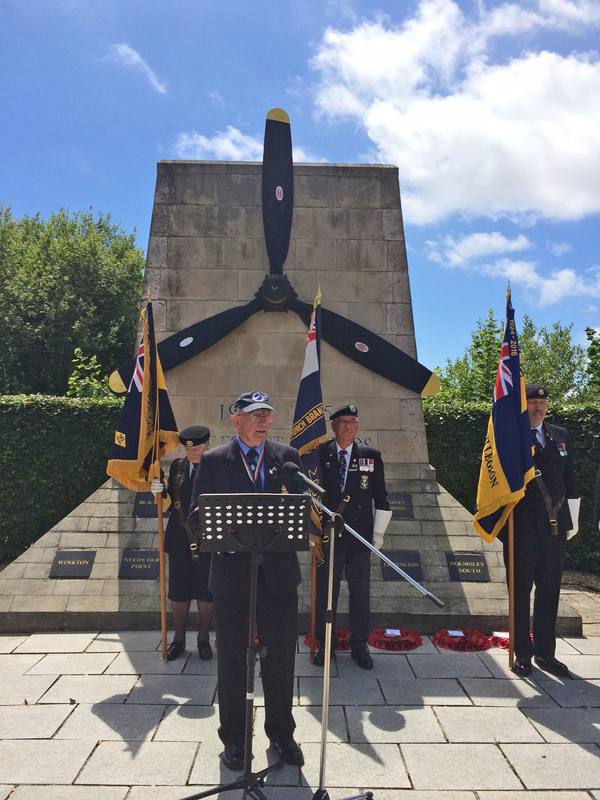 Several Veterans and Service organisation standard bearers attended to remember the 20,000 airmen and ground crews, and the 10,000 civilians, who staffed and supported the airfields during World War II.